It took my kids exactly two Easters to decide that in the Easter Bunny department, we had a dud. Instead of hiding chocolates, this particular rabbit hid grapes. No one will think I’m mean when my kids are still cavity free at age 30! Not to worry, we’ve still got some good Easter treats up our sleeves. Spoiler: not one of them involves chocolate. 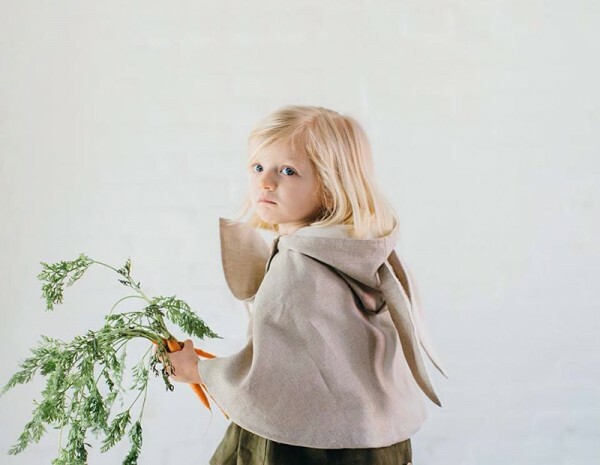 These gorgeous Linen Rabbit Capes ($187) by Tortoise & the Hare are hot off the sewing machines: their spring collection just launched on 1 March. All of Tortoise & the Hare’s collection is designed and hand sewn in a Pennsylvania farm studio; even the wooden buttons are made in America. These capes are classic, heirloom pieces made of beautiful fabrics like natural linen or red cuorduroy, lined with bamboo fleece. If your kids are lucky enough to get a few chocolates this year, La De Dah Kids’ Bunny Bag ($40) is the perfect place to store them. 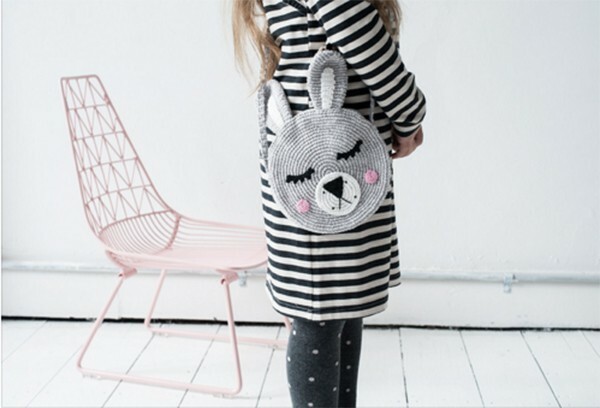 The bag is hand-crocheted, and after Easter is finished, it’ll make the perfect place to secret away little treasures like interesting rocks, plastic animals or more chocolate bought with pocket money. 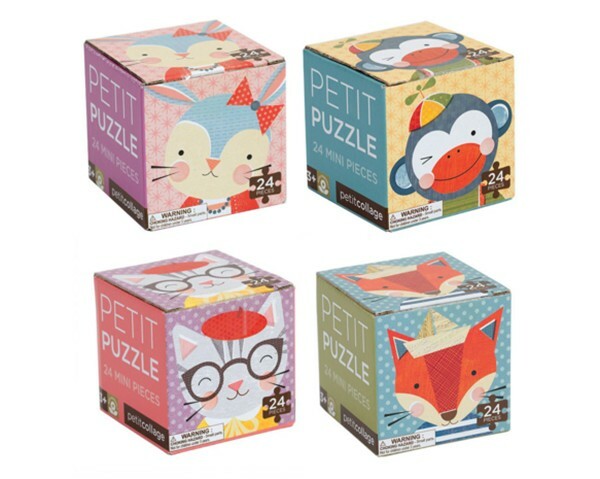 Petit Collage’s Petit Puzzles are gorgeous, colourful puzzles for kids aged three and up. There’s a monkey in a propeller cap, a bespectacled, beret-wearing cat or in keeping with the Easter theme, a floppy-eared bunny. With 24 pieces, these puzzles are just tricky enough to keep kids busy, but not so tricky they interrupt your dinner making with cries for help. Sonny Angel dolls ($16.95) are cult classic toys from Japan, and we’re dying over the adorable limited edition Easter collection. With their decorative Easter hats and tiny tees, these dolls are cuter than cute, and just the right size to tuck into the La De Dah crocheted bunny bag. 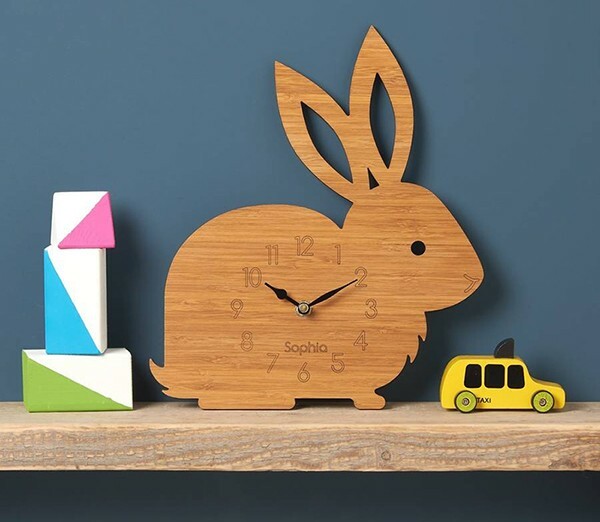 Rabbit shaped personalised wall clocks ($76) from Owl & Otter make lovely nursery decorations, and they can be personalised with your child’s name, nickname, or anything you want really. The clocks are made from bamboo that’s carefully sanded and oiled to highlight the wood’s natural grain. Bring back the egg cup! These lovely beechwood handpainted characters ($24.95) by Lucie Kaas are an updated version of the traditional Danish egg cups called “Bordfolk” or table people. We can’t say for sure, but they might just be special enough to convert egg rejectors into egg lovers. These adorable ragdoll superhero bunnies ($99) from Etsy shop La Loba make great little buddies. They promise to always make kids laugh, and never care if they’re crazy or quiet. The rabbit is handmade and comes with a superhero mask, double sided cape and super underpants to make rabbit pals super fast. The Bunny Boo game ($34.95) from Smart Games introduces kids to math concepts by giving them different logic challenges to solve with the wooden bunny and coloured blocks. Is the rabbit looking out of the round hole or the star-shaped one? Is it standing on the yellow, red or blue block? There are 60 challenge cards and the game is single player. 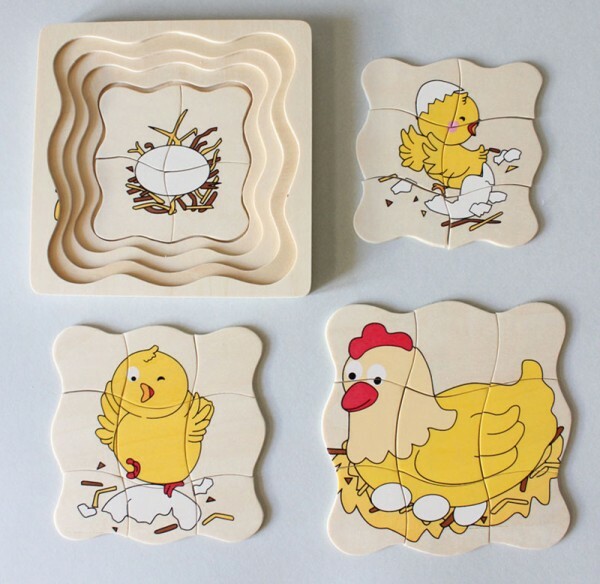 For such an ingenious puzzle, the four-in-one Chicken Life Cycle puzzle is incredibly good value at $12. Now the only puzzle to crack is which came first, the chicken or the egg. Better have an answer ready, because kids love to ask tough questions. For some, the Easter reference might be a stretch, but there is a white rabbit involved, and so we couldn’t resist including this beautiful version of Alice in Wonderland ($42) It’s illustrated by Anna Bond, the talent and creative direction behind the covetable stationery by Rifle Paper Co. 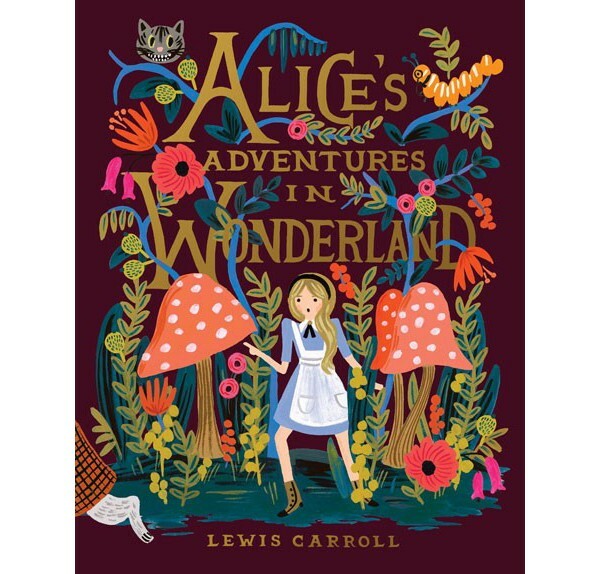 Kids will be puzzling over Lewis Carrol’s odd wonderland for many Easters to come. Admit it: your iPad hasn’t been your iPad for a long time now. The symbol of surrender? 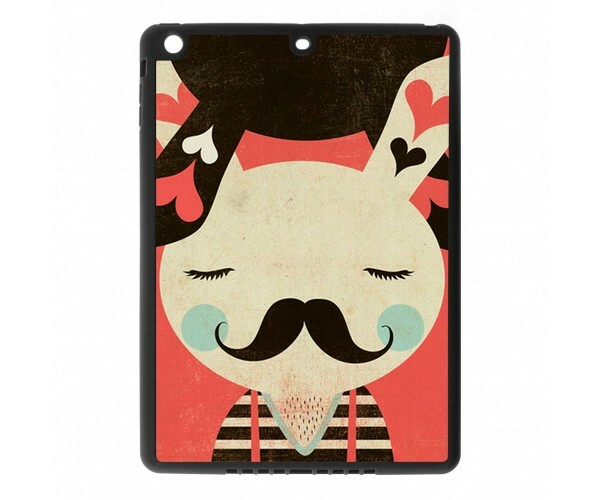 This moustachioed rabbit iPad case. Small, smaller, smallest…smallerest, smallestest? 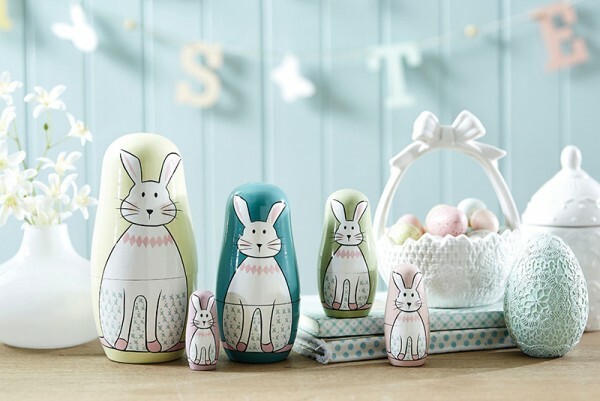 Inventive grammar aside, these rabbit babushka dolls ($24.95) from Bed Bath and Table make gorgeous Easter decorations. We suspect they won’t be put away when the holiday has passed. With plenty of delectable ideas for gifts, we’re confident you’ll be able to keep your kids out of sugar for at least one more Easter. Check back with us for a big kids Easter gift guide tomorrow.